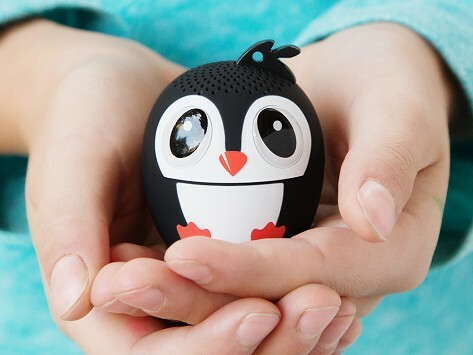 This kids’ Bluetooth speaker looks like a tiny, adorable animal, but don’t let the sweet little face fool you into thinking it can’t crank out the tunes. The speaker creates great sound in a design about the size of a golf ball. It is packed with features like a wireless selfie remote shutter, built-in mic for phone calls, and optional pairing that lets two speakers create a stereo-sound experience. (And that doubles down on the cuteness.) USB rechargeable for up to six hours of playing time. Pop one onto a backpack for a party to go. Lightweight design weighs only 1.4 oz. Dimensions: 2" x 1.25" x 1.25"
my elementary students love these speakers. I write grommet.com on a piece of paper when they ask where they can get them. Although the sound is small, the aesthetics is very appealing. A pet speaker can jam for up to six hours, and is USB rechargeable. Taking the dance party to the playground? These adorable animals are made to be seen and built to take on the go. Just clip one—or the whole zoo—onto a backpack.